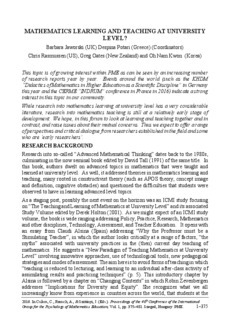 In this RF we focus on a range of issues relating to Mathematics Learning and Teaching at University level. These include relationships of a number of kinds relevant to enhancing and improving the experiences of students’ learning at this level, and to our wider knowledge and understanding. We see relationships between learning and teaching in Calculus; between didactics, pedagogy and mathematics in teaching for student understanding; between mathematicians and mathematics educators who seek to develop their teaching. We address characteristics of inquiry-based teaching, teaching in lectures and in small groups; and conclude with a theoretical vision asking how the theories we use influence what we learn in our research. We invite audience consideration of issues arising in the above.